Home HEALTH DOCTOR PROFILES Paul Monsour, M.D. The latest tech toy for Dr. Monsour and his team is TomoTherapy — the only one of its kind in the city. TomoTherapy combines advanced radiation therapy with the accuracy of CT scanning and calculates the appropriate position, pattern and intensity level to deliver powerful radiation to a precise area of a patient’s tumor. “What this allows us to do is not so much deliver radiation to the tumor — although that does happen — but deliver much less radiation to the healthy tissue around it,” Dr. Monsour says. 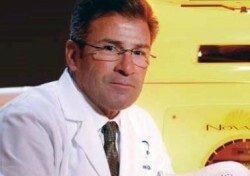 Normal tissue has a certain tolerance for radiation he says, and, before TomoTherapy, some patients would reach a point where the risk to the healthy tissue would require them to stop treatment. A lung cancer he treated recently that would have previously affected 28 percent of a good lung was knocked down to 13 percent on the new machine. Not every cancer benefits from TomoTherapy. According to Dr. Monsour, typical use would be for more advanced cancers, especially very advanced cases of breast and lung cancers, certain prostate cancers and cancers of the head and neck. Another advantage is for cancers that have spread to a large area. The tumors can be targeted to receive a single field of radiation without potential gaps or over-radiation through overlap. With technology comes longevity. After decades in the radiation oncology field, Dr. Monsour now sees patients all the time who he knows for a fact would not have survived their cancer just a few years prior. “When I first started doing this, the median survival rate of someone with advanced lung cancer was about eight months,” Dr. Monsour says. He shares a story of a woman with extremely advanced cancer of the larynx. She couldn’t talk and could barely breathe. She refused to have her larynx removed so Dr. Monsour and his team treated her with radiation therapy. It’s the people: “I’m fortunate enough to work with a really, really good group of people,” Dr. Monsour says. “Our department’s been here since 1991 — I only know of one person who’s left in that time. Everybody loves to work here; it’s like a family. If we can’t get rid of the cancer, we can make people feel better, and try to be as happy and upbeat as possible … it’s a tough, tough thing to go through … .” Every year for Christmas, the practice pools their money for a patient going through financial hardship. And a big group of them — led by Dr. Monsour in a lime green jumpsuit — love to attend the Lympho-Maniac Cancer Benefit, the annual disco gala fundraiser for local cancer causes.